Definition at line 27 of file CLStyle.h. Definition at line 26 of file CLStyle.cpp. Definition at line 37 of file CLStyle.cpp. Definition at line 54 of file CLStyle.cpp. References createStringFromSet(), mRoleList, mTypeList, and readIntoSet(). Definition at line 67 of file CLStyle.cpp. Adds an role to the role list. Definition at line 115 of file CLStyle.cpp. Adds the attributes for a style object to the passed in. object. Definition at line 237 of file CLStyle.cpp. References createStringFromSet(), mpGroup, mRoleList, mTypeList, readIntoSet(), and CLGroup::toSBML(). Referenced by CLGlobalStyle::toSBML(), and CLLocalStyle::toSBML(). Adds a type to the type list. Adds an type to the type list. Definition at line 147 of file CLStyle.cpp. Definition at line 182 of file CLStyle.cpp. Referenced by addSBMLAttributes(), CLLocalStyle::CLLocalStyle(), CLStyle(), CCopasiXML::saveLocalStyle(), CCopasiXML::saveStyleAttributes(), and CLLocalStyle::toSBML(). Definition at line 91 of file CLStyle.cpp. Referenced by CLRenderFlattener::convertGlobalToLocalStyle(), CQConnectionGraphicsItem::CQConnectionGraphicsItem(), CQLabelGraphicsItem::CQLabelGraphicsItem(), CLLayoutRenderer::draw_object(), CLLayoutRenderer::draw_text(), CLLayoutRenderer::extract_group_attributes(), CQRenderConverter::fillGroupFromStyle(), CCopasiXML::saveStyleElements(), and CCopasiXMLParser::GroupElement::start(). Definition at line 99 of file CLStyle.cpp. Definition at line 228 of file CLStyle.cpp. Returns the number of roles in the role list. Returns the number roles ids in the role list. Definition at line 107 of file CLStyle.cpp. Returns the number of types in the type list. Definition at line 139 of file CLStyle.cpp. Definition at line 201 of file CLStyle.cpp. Referenced by CLRenderFlattener::convertGlobalToLocalStyle(), CLRenderResolver::fill_global_maps(), CLRenderResolver::fill_local_maps(), CLRenderFlattener::flatten(), and CCopasiXML::saveStyleAttributes(). Definition at line 206 of file CLStyle.cpp. Checks whether a given role is in the role list. Definition at line 123 of file CLStyle.cpp. Checks whether a given type is in the type list. Definition at line 155 of file CLStyle.cpp. Definition at line 168 of file CLStyle.cpp. Referenced by addSBMLAttributes(), CLLocalStyle::CLLocalStyle(), CLStyle(), CCopasiXMLParser::LocalStyleElement::start(), CCopasiXMLParser::GlobalStyleElement::start(), and CLLocalStyle::toSBML(). Removes a role from the role list. Removes an role from the role list. Definition at line 131 of file CLStyle.cpp. Removes an type from the type list. Definition at line 163 of file CLStyle.cpp. Definition at line 75 of file CLStyle.cpp. 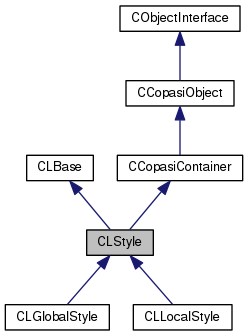 Referenced by CLRenderFlattener::convertGlobalToLocalStyle(), and CCopasiXMLParser::GroupElement::start(). Definition at line 211 of file CLStyle.cpp. Referenced by CLRenderFlattener::convertGlobalToLocalStyle(), CCopasiXMLParser::LocalStyleElement::start(), and CCopasiXMLParser::GlobalStyleElement::start(). Definition at line 218 of file CLStyle.cpp. key string for the style. Definition at line 41 of file CLStyle.h. Referenced by CLGlobalStyle::CLGlobalStyle(), CLLocalStyle::CLLocalStyle(), getKey(), and ~CLStyle(). Definition at line 36 of file CLStyle.h. Referenced by addSBMLAttributes(), CLStyle(), getGroup(), and setGroup(). Definition at line 34 of file CLStyle.h. Referenced by addRole(), addSBMLAttributes(), CLStyle(), getNumRoles(), getRoleList(), isInRoleList(), removeRole(), and setRoleList(). Definition at line 35 of file CLStyle.h. Referenced by addSBMLAttributes(), addType(), CLStyle(), getNumTypes(), getTypeList(), isInTypeList(), removeType(), and setTypeList().